SEATTLE--(BUSINESS WIRE)--(NASDAQ: AMZN)—Amazon today introduced the third generation of Kindle Fire—the all-new Kindle Fire HDX. The new Kindle Fire HDX tablets combine groundbreaking hardware, the latest version of Fire OS, and exclusive new features and services like X-Ray for Music, Second Screen, Prime Instant Video downloads, and the revolutionary new Mayday button. Learn more about the new Kindle Fire HDX family at www.amazon.com/hdx. Stunning exclusive HDX display—beyond HD with exceptional pixel density (323 ppi for 7”, 339 ppi for 8.9”), perfect 100% sRGB color accuracy, reduced glare, dynamic image contrast, and improved brightness for better viewing in any lighting conditions. Powerful quad-core Snapdragon 800 processor running at 2.2 GHz provides over 3x the processing power compared to the previous generation, plus the latest graphics engine and 2x more memory for fast and fluid performance. These are the only tablets with a processor over 2 GHz. Startlingly light design—at just 13.2 ounces, the 8.9” Kindle Fire HDX is the lightest large-screen tablet, 34% lighter than the previous generation. Powered by the latest version of Fire OS—Fire OS 3.0 “Mojito”—with hundreds of new and upgraded features, platform updates, and Amazon-exclusive services like X-Ray for Music, Cloud Collections, Goodreads, and more. New Mayday button delivers revolutionary live tech support—one touch connects you to an Amazon expert who can guide you remotely through any feature—24x7, 365 days a year, and it’s free. 15 seconds or less is the Mayday response time goal. All-day battery life—up to 11 hours of mixed use and 17 hours of reading. Updated email, calendar, and Silk browser to stay connected and productive. New enterprise features including hardware and software-encryption, Kerberos Intranet, secure Wi-Fi connections, VPN integration, and wireless printing. Both HDX 7” and 8.9” available with ultra-fast 4G LTE wireless. Available on the AT&T network, and for the first time on the Verizon Wireless network. Dual stereo speakers with Dolby Digital Plus audio and virtual 5.1 multi-channel surround sound—the standard in high-end audio. Front-facing HD camera makes it easy to stay in touch with Skype, plus a new 8 megapixel wide- aperture rear-facing camera on the 8.9” Fire HDX offers crisp photos and 1080p HD video. Best video experience on a tablet with new Amazon-exclusive features like Prime Instant Video downloads, Second Screen, and expanded X-Ray for Movies and TV. Deep integration with the world's best content ecosystem—over 27 million movies, TV shows, songs, apps, games, books, audiobooks and magazines. New Origami covers feature an innovative design that allows you to position Fire HDX in both portrait and landscape. Amazon’s exclusive HDX display brings together exceptional pixel density (1920x1200 at 323 ppi for 7”, 2560x1600 at 339 ppi for 8.9”) and perfect color accuracy (100% sRGB), resulting in images and videos that display as the photographer or videographer intended. The new display also features dynamic image contrast, a unique algorithm that adjusts the color of each pixel depending on the ambient brightness in order to maximize contrast. This makes images and videos even easier to see in any lighting conditions, including outdoors. See a video: www.amazon.com/display. 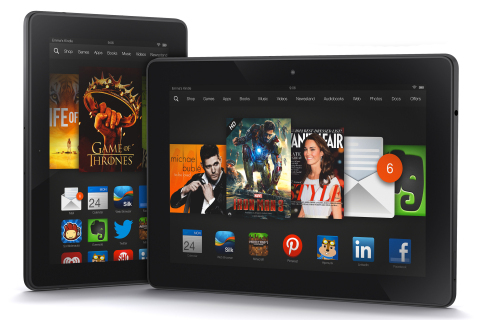 Kindle Fire HDX tablets are the first tablets powered by the most advanced quad-core Snapdragon 800 processor. These are the only tablets with a processor over 2 GHz—the four cores can each run at 2.2GHz, providing 28 billion instructions per second—over 3x the processing power of the previous generation Kindle Fire HD. Fire HDX also doubles the RAM to 2GB, resulting in faster app launch times, faster website load times, smoother multi-tasking, and better overall performance. The new Adreno 330 graphics engine on Kindle Fire HDX delivers 4x the graphics performance of the previous generation Kindle Fire HD. This combination of a new graphics engine, HDX display, quad-core processor, and 2x the memory creates a more immersive, high-frame rate HD gaming experience. Amazon integrated the capacitive touch layer directly into the glass display on Fire HDX, leaving a lighter single layer instead of the typical 2-layer display stack. The Kindle Fire HDX 8.9” frame is a single-piece of machined magnesium with a blend of glass and nylon molded onto the unibody to create openings for the antennas and maximize signal strength without sacrificing sturdiness. The result is the lightest large-screen tablet—at just 13.2 ounces, it is 34% lighter than the previous generation large-screen Fire HD tablet. Even with all this additional power, Fire HDX still delivers 11 hours of mixed use battery life. When you are reading, Fire HDX automatically powers down the CPU and any unnecessary system components and stores the displayed text in dedicated, low-power memory—the result is up to 17 hours of battery life for reading. Both the 7” and 8.9” Kindle Fire HDX feature a front-facing HD camera to help you stay in touch with friends and family with Skype. Fire HDX 8.9” features an 8 megapixel rear-facing camera that allows for high-resolution photos and 1080p HD video, plus an LED flash, Electronic Image Stabilization, and a wide-aperture 5P f2.2 lens that lets in more light, reducing exposure times and producing sharper images. See a video: www.amazon.com/fire-camera. New origami-style cover design provides a simple stand for both portrait and landscape positions, and attaches magnetically so it’s easy to take on and off. The cover for the 8.9” Fire HDX features a custom slide feature that quickly exposes the rear-facing camera and automatically launches the camera application so you won’t miss a great photo opportunity. See a video: www.amazon.com/quickpic. Having trouble or want to learn how to use a new feature? Simply tap the Mayday button in Quick Settings, and an Amazon expert will appear on your Fire HDX and can co-pilot you through any feature by drawing on your screen, walking you through how to do something yourself, or doing it for you—whatever works best. 15 seconds or less is the Mayday response time goal. Mayday is available 24x7, 365 days a year, and it’s free. See the separate press release on the Mayday button and preview three upcoming TV ads that show how the Mayday button works: www.amazon.com/mayday. Kindle Fire HDX is powered by the newest version of Fire OS – Fire OS 3.0 “Mojito”, which introduces hundreds of new and upgraded features, Amazon-exclusive services, platform updates and more. Fire OS starts with Android and adds cloud services, a content-first user interface, built-in media libraries, productivity apps and low-level platform enhancements to integrate Amazon’s digital content and improve performance for Kindle Fire tablets. If an app runs on Android, it can run on Fire OS. Read more: www.amazon.com/fireos. Prime Instant Video is the only U.S. online subscription streaming service that enables offline viewing—on a plane, on vacation, and anywhere else where you may not have Wi-Fi. Tens of thousands of Prime Instant Videos are now available for download on Fire HDX. If you are new to Prime, you get one free month of Amazon Prime when you purchase Fire HDX. Amazon is expanding X-Ray to music by adding lyrics that let you follow along with songs. Lyrics display and scroll automatically line-by-line as the song plays. See a screenshot: www.amazon.com/x-ray. Customer-favorite X-Ray for Movies and TV now shows the names of songs as they play as well as a list of all music in the movie or TV show, and lets you jump to the scene in which a particular song is playing. X-Ray also shows trivia items in context with the action on the screen. For example, in The Godfather when Clemenza tells his henchman to “leave the gun, take the cannoli”, X-Ray alerts you that actor Richard Castellano ad-libbed that famous line of dialog. X-Ray for TV also provides character backstories so you can easily remind yourself of the character’s history. X-Ray is offered only by Amazon and is powered by IMDb. Fling TV shows and movies from your tablet to your big-screen TV using Second Screen, which turns your TV into the primary screen and frees up your Fire HDX to provide playback controls, a customized display for X-Ray, or simply a place to email, browse the web, and more while you watch a movie. Second Screen will be available starting next month for PlayStation 3 and Samsung TVs, and later this year for PlayStation 4. You can also wirelessly mirror movies, TV shows and photos from your tablets to your big-screen TV with Miracast-enabled accessories or TVs. With the new email on Fire HDX, it is easier than ever to set up your accounts, group conversations by subject, sync your email and more. Reading and managing documents on Fire HDX is simple: email them, sync them from a computer with Cloud Drive, clip them from the web with Send to Kindle, or transfer them via USB. Coming mid-November as part of the free, over-the-air Fire OS 3.1 update—print documents, photos, emails, and calendar events directly from Kindle Fire to compatible wireless printers. Fire HDX is ready for work, with support for encryption of the user partition of the device to secure data; support for Kerberos authentication so corporate users can browse secure intranet websites; the ability to connect to secure enterprise Wi-Fi networks as well as corporate networks via a native or a 3rd party VPN client; and Mobile Device Management solutions ranging from Amazon’s Whispercast service to 3rd party vendors like AirWatch, Citrix, Fiberlink, Good Technology, and SOTI. Some of these features will be delivered as part of the Fire OS 3.1 update. See the separate press release on enterprise features: www.amazon.com/kindle-enterprise. Organize your books, newspapers, magazines, and apps in customized collections for easy reference, and Amazon’s Whispersync technology synchronizes the collections across your Kindle devices and reading apps so they’re available on all of your devices. Cloud Collections will be available as part of the Fire OS 3.1 update. Join over 20 million other readers and see what your friends are reading, share highlights, and rate the books you read with Goodreads on Kindle, available exclusively from Amazon. Goodreads will be available as part of the Fire OS 3.1 update. See screenshots: www.amazon.com/goodreads. Blind and visually impaired customers will discover new and improved accessibility tools such as Screen Reader, Explore by Touch, and Screen Magnifier, enabling access to the vast majority of Kindle Fire features. Screen Reader features IVONA’s award-winning natural language text-to-speech voice. Kindle Fire’s Special Offers are better than ever with exclusive limited-time, limited-quantity deals available directly from the lock screen. These deals are similar to Lightning Deals that run on Amazon.com, but with even greater savings. The first deal, available in the coming weeks, will be the Madden NFL 25 video game for $5 (92% off). See screenshots: www.amazon.com/offers. Over 150,000 movies and TV episodes—stream or download, purchase or rent. Tens of thousands of popular movies and TV episodes are available at no additional cost for Prime members with Prime Instant Video, the exclusive subscription streaming home to shows like Downton Abbey, Under the Dome, Justified, Dora the Explorer, Blues Clues and many more. The most popular apps and games. Apps are tested for the Amazon Appstore and Kindle Fire. Millions of songs—stream, download, and store purchases for free in the cloud for access anytime, anywhere. Hundreds of magazines and newspapers. Millions of books, including hundreds of thousands of titles that are exclusive to the Kindle Store. Over a million titles are $4.99 or less, over 1.7 million are $9.99 or less. Over 400,000 titles available for Prime members who own a Kindle to borrow for free as part of Kindle Owners’ Lending Library. Over 150,000 professionally-narrated audiobook titles, with free samples to listen to before buying. With apps available on the largest number of devices and platforms, Amazon makes it easier than ever to access your content anytime, anywhere. Use the Kindle, Amazon Instant Video, Amazon MP3 and Amazon Appstore for Android apps to “Buy Once, Enjoy Everywhere.” No other company offers the same level of flexibility with your content. The 7” Kindle Fire HDX is $229. It is available for pre-order starting today at www.amazon.com/hdx-7 and it will begin shipping October 18. The 4G version is $329—you can pre-order today to reserve your place in line at www.amazon.com/4g-hdx-7 and it will begin shipping November 14. The 8.9” Kindle Fire HDX is $379. It is available for pre-order starting today at www.amazon.com/hdx and it will begin shipping on November 7. The 4G version is $479—you can pre-order today to reserve your place in line at www.amazon.com/4g-hdx and it will begin shipping December 10. The 4G devices have not been authorized as required by the rules of the Federal Communications Commission. These devices are not, and may not be, offered for sale or lease, or sold or leased, until authorization is obtained.